Is Following a Passion a Good Changing Career Advice? Changing Career Advice – Should You Follow Your Passion? This changing career advice sounds familiar to you? Follow your passion and you’ll get a perfect career. The career advice is based on the assumption that you’ll endure in hard times during your career change journey. In life, however, that advice is not always easy to follow. I have no doubt that passion is a crucial element for a successful career change. However, your passion won’t lead you to an ideal career if you ignore other factors like values, mission, and strengths. In addition to following a passion you will also need to thoroughly analyze your life and career directions. This career change advice shows you those factors. Just learn about them and make sure to include them in your career change plan. Evaluate aspects of your current job that you dislike. What are the sources of your dissatisfaction? Are they related to your work content or your work environment? Find out your career interests. Open up the reports of career interest tests you’ve taken to discover your interests’ inclination. If you can identify that your job is somewhat close to your interests then job content is not the cause of your job dissatisfaction. Understand your passions. What activities excite you? Do you get joy and energy from your hobbies? can you connect those with your career interests? If your interests don’t match your current job content chances are slim that your passions are inside your job. Identify your strengths or talents. If money were not an issue, what would you do naturally? Your strengths aren’t skills that you master because your job requires you to have them. They are the natural abilities you were born with and developed during your childhood. So ask your parents and others who knew you well in your early life. Assess your core values. What is important to you? Is it money, social status, family, security, or challenges? In managing career and family, which one gets a higher priority? Do you prefer a job with a better salary or one that offers more time with family? Discuss this issue with those who have influenced your childhood’s values. Discover your life’s mission. “Why am I here?” is a common question you often ask yourself when you were young. The question is still valid for discovering what to accomplish at the end of your life. Once you find your life’s mission clarify it with your values. When your mission aligns with the values you’ll be ready to handle any kinds of adversities. With a careful and honest self-assessment you’ll get a clue about your career. However, you’ll get better results if you conduct online comparative study of the fields as well as develop the industries’ network for informational interviews. Look for a part-time job related to the suggested occupations. You may take a weekend or night part-time job to learn the content and the environment of your career choices one by one. Decide your best career choice based on the best fit of the temporary job with your passions, values, talents, and personal mission. Take relevant training and education. Does your new career need a formal education or special training? If so, get a weekend master degree or an evening graduate degree program in a local university or online. Or if it requires a specific certificate, enroll in a relevant certification program. When available, you may also ask your employer for a relevant job assignment to help you develop necessary skills for the new career. Set a realistic expectation. How wide is the gap between your current position and your ideal career? For example, you’re an older woman, what are the main obstacles you’re going to meet along your career change process? Develop an action plan to remove the obstacles and remember to reward yourself every time you take away one obstacle. This changing career advice requires you to take a longer path in selecting an ideal career. But it’s worth your efforts because changing career is an extremely serious life decision. 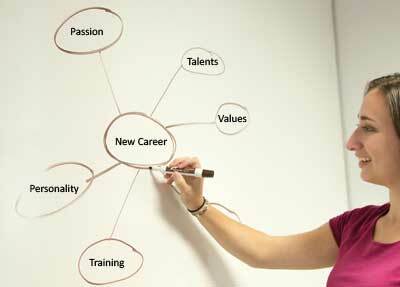 Get a more comprehensive tutorial on career change here.